Every athlete knows that sweet ache of sore muscles, that feeling of the body reminding you of the exertion you used to feel the exhilaration of your workout. It can be an addiction, a characteristic that we define ourselves by. And sometimes that soreness slides out of the sweet ache of good training and into the bitter pain of injury. Unfortunately, some of us find out a little too late that some of the more insidious consequences of "training gone wrong" can drop us into biomechanical dysfunction and massive pain. Before the workout that you love leaves you feeling more like cripple than crusher, it's time to rehab your movement patterns and prehab yourself from injury. What do I mean by "prehab"? If you want to race your car, you practice your driving. You get better and better at driving faster and faster, and eventually you get skilled enough and paid enough to get more powerful cars to race. You make the move up from Honda rice rocket to Lamborghini, and you're feeling good. But then one day, as you go to hit the track, you notice that the car isn't handling properly. It's feeling a little slow, so you floor the accelerator in hopes of getting more out of the engine. The car still doesn't perform as smoothly as possible, but somehow, despite the added stress of the car's unresponsive handling, you win the race. You keep racing until suddenly the car has a massive blow out, sending you up into the air in a fireball and taking out others on the track. Sound a little dramatic? Maybe, maybe not. Let's say that the problem could have been solved easily with just a proper alignment, something that every proper pit crew would check before every race. But let's assume that this was overlooked because "it was never a problem before". That misaligned front wheel led to uneven wear on the tire and less responsive handling. It also forced the driver to exert more force and spend more mental energy to drive the car in the proper direction. Ultimately, the uneven wear on the tire led to a premature blowout, which leads almost inevitably to injury. When it comes to your body, the joints need to be able to find alignment on the fly. You don't have time to think about where or how to align your skeleton. It needs to happen on a natural, reflexive level. And that can be trained! The first, and perhaps most important, part of that process is to seek out the parking brakes and take them off PRIOR to training. Trigger points (also commonly referred to as "knots" in the muscle) are the body's means of creating artificial stability in a system that isn't functioning properly. That dysfunction can come from all sorts of different sources - prior injury, poor ergonomics, disease, or even improper training. So when the muscle tissue starts developing trigger points, it loses some contractile ability. But because the neuromuscular system is adaptable, this isn't a life sentence. Massage is one means of helping your body undo trigger points. But unless you're oil sheikh rich and have massage therapists at your beck & call 24-7, it's kind of unrealistic to try to plan out your workouts such that they're bordered by massage appointments. A foam roller, however, is your next best option. The foam roller is perhaps one of the most under-appreciated tools in the arsenal of fitness gear, and knowing how to use it properly can allow you to get some of the most productive deep tissue trigger point releases before you train. This allows you to gun the gas without having the parking brakes on at the same time. By applying pressure to the triggered up muscles, the roller sends a signal to the nervous system that something needs to change. The fascia (think of that white membrane around the chicken breast before you cook it) holds the muscle tissue inside, and the nerve endings in the muscle (myo-) and fascial systems can tune out the tension created inside it by trigger points. That's when intelligent use of tools like the foam roller can help recalibrate your nervous system, giving it a chance to recognize areas of tension and dysfunction and release them. Please watch the above clip on foam rolling the quads, some of the most overtrained muscles in modern society. For those of you who've long suffered with stiff backs, love to squat or lunge, and still have a hard time developing the glutes that your body needs to counterbalance your quads, this might well be the saving grace that you've been waiting for! Read part two of this series on the finer points of foam rolling! Dr. Mark Cheng, L.Ac., Ph.D., Sr SFG Instructor, FMS faculty, TRX Sports Med, & Tai Cheng creator. 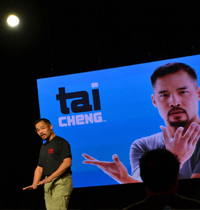 Dr. Cheng is a speaker/lecturer on optimum human performance & orthopedic medicine through the lenses of Pavel Tsatsouline's kettlebell training methods, FMS Functional Movement patterning, TRX Sports Medicine rehabilitative & strength training, traditional martial arts/combative systems, & Chinese manual medicine.